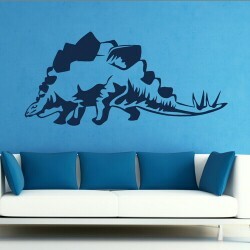 There is an everlasting fascination with dinosaurs. Children and adults alike are captivated by a range of species that will never be seen again in our lifetime. The incredible library of knowledge that humans have gathered about dinosaurs provides an almost endless supply of education and interest. While all ages are able to follow a lifelong curiosity with dinosaurs, it is only children that have the opportunity to turn their bedroom into their own personal dinosaur museum. 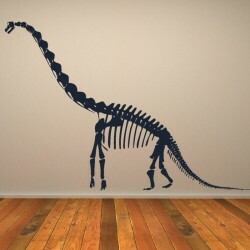 Is there a better way to add to the personal dinosaur designed bedroom than by adding dinosaur wall stickers such as the Brachiosaurus Childrens Wall Sticker or perhaps the Stegosaurus Dinosaur Wall Decal? From playing with cheap plastic dinosaur toys to the most wonderful animated 3-D books and DVDs, children and parents are brought together throughout the learning process. Children will learn how fossils were formed, about different rock formations and how the Earth has changed over the centuries. 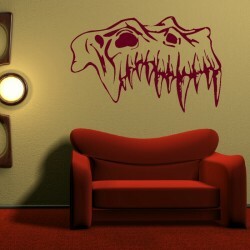 Dinosaur wall stickers provide an easy way to decorate and quickly liven up a room. An interest in dinosaurs teaches children how to research a subject, which is a lifelong skill that can be adapted across a range of themes. These vinyl adhesive stickers can be removed and replaced by a different range of stickers when children grow out of the interest or just simply wish to grow up and show their friends that they’re still trendy. Where a child is able to combine education and fun, they will learn much more quickly. 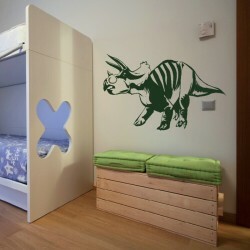 By adding some dinosaur wall stickers to a child’s bedroom wall, parents can easily become involved in discussions and stories about dinosaurs, without having to admit that they’d like some stickers on their own wall really!